In 1993, Cath Kidston opened her first store – a small shop in Notting Hill, London. Selling brightly coloured, customised second-hand furniture, vintage fabrics and wallpapers, Cath Kidston developed a unique design style that turned practical products into something witty, fresh and fun. The shop and products soon became a cult success. Today, Cath Kidston Ltd has become one of the most influential and original design companies to emerge from the UK in recent years and has expanded steadily to become the unique global consumer brand it is today. Originally inspired by taking traditional print and using it in a fresh, surprising and modern way, Cath began to design her own unique printed textiles and used them to create simple practical everyday products. One of the first ‘Cath Kidston’ products was a printed ironing board cover. Practical, quirky and with a distinctive floral print, it has come to epitomize the Cath Kidston look and remains an iconic item in the collection to this day. 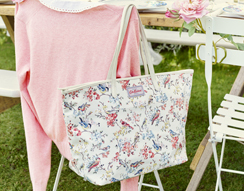 Almost two decades later, the brand continues to create useful everyday things with a unique Cath Kidston twist - a twist that transforms everyday products into must have items. As the desire for Cath Kidston products has grown, the collections have expanded into a full lifestyle offering across laundry, home ware, accessories, women’s clothing and most recently, Cath Kids. The brand continues to go from strength to strength, expanding product offerings and opening new stores across the globe.